Gasp | The Blogfather | Now Is The Winter Of Our Discontent. What The Fcuk Is Content Anyway? What the Fcuk is content anyway? I read this blog on the weekend by Sarah Quinn, who works for the Content Marketing Agency Wyzowl, the grandly titled: “The Evolution of Content Marketing”. Naturally I read on in the hope of getting illumination. “Content is highly regarded as one of the best ways to draw in leads, drive sales and promote your brand.” OK, so “content,” sounds really important, but what is it? Say what? No it doesn’t. I did laugh when I read this and assumed it to be a joke; a dry comment on the overuse of jargon, but there did not appear to be a trace of irreverence. By way of supporting evidence, Sarah links us to a “Brief History of Content Marketing” timeline where some of the content is, somewhat ironically, missing. Or if it is not missing, it looks like the evolution of content marketing stalled somewhat after the cavemen started it all in 4200BC because, as you can see, it seems to have been inactive from the Late Neolithic Period until the Late Victorian period and the year 1895, a span of some 6095 years. Now, I propose that there are no examples of content marketing in this vast period due to the small but vital fact that content marketing doesn’t, in essence, actually exist. At least it didn’t in this period. I came across this article when researching. It starts really positively, stating boldly: “stop labelling everything content.” But it then goes on to be very vague, name drops a good bit, and ends up taking the form of an article which merely gives an overview on the content of Marketing Magazine’s month on content! They do, admittedly, have their tongue in cheek, and it is true that content is being used in relation to too many things, but it probably should never have been used in the first place. It is too general in its meaning. It was always likely to spill and wash over everything. I recall watching Sky Sports News, and Iain Dowie amusing me by using the word 'vignette' to describe a battle between a left back and a winger in the sweeping epic of the Bolton v Stoke game. I knew what he meant, but I thought: you don’t really know what that word means Iain. You’re just trying to impress too much. And I think it is the same with content. Lots of people are using it, without really knowing how to define it, but keep telling everyone else it is very important. The thinking behind good content is that it lingers with and enriches the consumer's life, so when they encounter your brand in the form of a more direct ad, they already think you are synonymous with quality, knowledge etc. I am kind of OK with that loose definition. 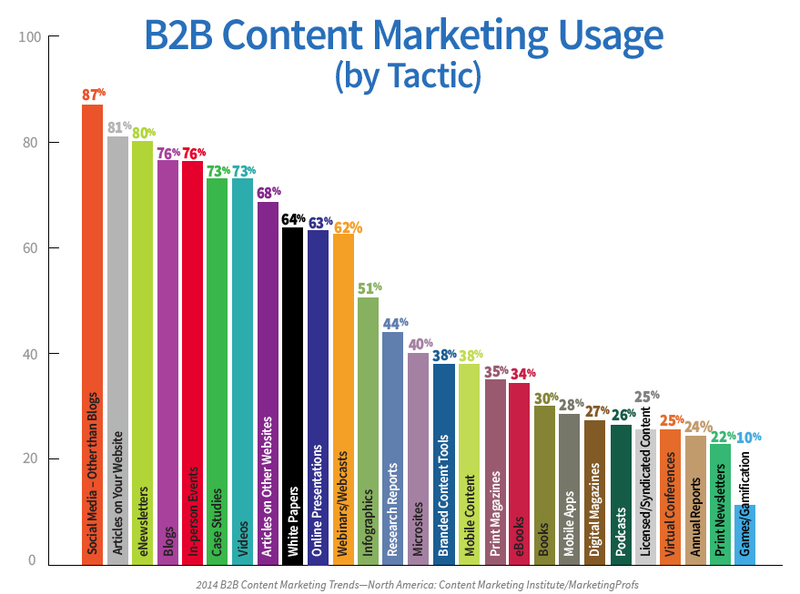 But that was until I saw this rascal of a graph from the Content Marketing Institute. It lists some 27 different facets of content marketing, including eNewsletters and printed newsletters, eBooks and books, print magazines and digital magazines, virtual conferences, blogs and on and on. Confusion reigns. Content is in danger of going the way of email, in that so much of it will end up being unread/unwatched as junk. We are clearly close to a tipping point. At Gasp we recently made a pitch on the perils of too much, poor quality content. As soon as you lose the trust/interest in your content, it is very hard to get that back. The last thing you want is for your brand/company to become synonymous with sending out consistent dross. So go and find yourself a good story-teller.